WOODWORTH, La. -- For its third year, Louisiana 5-Day Academy for Spiritual Formation was held, providing a retreat from daily life for reflection and rejuvenation. Close to 34 laity and clergy from Tennessee, Georgia, Arkansas and Louisiana attended the academy Feb. 9-14 at The Wesley Center in Woodworth. The theme for this year's event was "Praying the Scriptures; Praying the Hours." Praying the Scriptures "is a way not only of reading the Bible for information, but also for the transformative Word and, some would say, so that the Bible reads you," explained Elise Eslinger of Dayton, Ohio, compiler and editor of the Upper Room Worshipbook, who served as worship/music coordinator for the 5-Day Academy. Eslinger cited a devotional practice called Lectio Divina "where you take time in silence and then you hear the Word or read the Word, and then you meditate on it ... take time with it ... rest in God's embrace, and then you get sent out to try to embody and be the Word." "In the meantime, (Praying) the Hours is just that ancient practice of pausing several times a day ... and take a time to just pray," Eslinger added. "People all over the world are doing this as well," she said, referencing I Thessalonians 5:17, that "the only way we can pray without ceasing is to have brothers and sisters everywhere who keep praying." "Praying the Scriptures" was presented by Sister Kathleen Flood of the Order of Preachers, Sinsinawa Dominican Congregation, an Illinois native who lives in Nashville, Tenn., and is director of contemplative programs and coordinator of the mentorship in spiritual direction for Stillpoint, INC. Flood also serves as an adjunct faculty member for the Doctor of Ministry program at Drew University in New Jersey and the Spiritual Formation Academy sponsored by the Upper Room, where she teaches in both the two-year and the five-day academies. "Praying the Hours" was presented by Robert Benson, a Tennessee author whose works include Between the Dreaming and the Coming True, Living Prayer and Digging In: Tending to Life in Your Own Backyard. Benson is an alumni of the Academy for Spiritual Formation, a member of the Friends of Silence & of the Poor, which is an international prayer community, and leads seminars and retreats on prayer, silence, writing and spirituality. 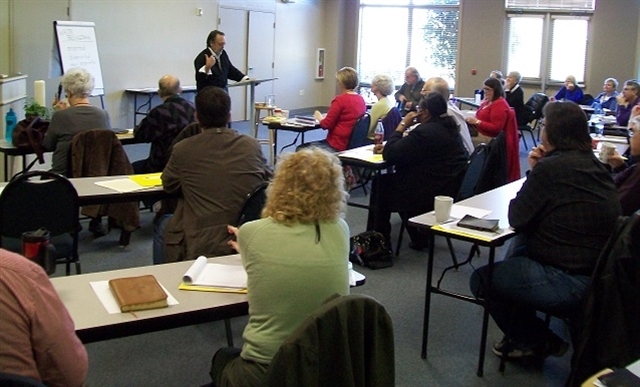 The 5-Day Academy is an off-shoot of the Upper Room Academy for Spiritual Formation that began in 1983, which is a retreat that meets eight times over a two-year period. The 5-Day Academy gives people a taste of what the Upper Room retreat is like for those who cannot afford the time or cost to attend the Upper Room retreat, to participate in the rhythm of study, prayer, worship and reflection. The 2015 sessions for the fourth annual retreat are set for Feb. 8th to Feb. 13th. Rev. 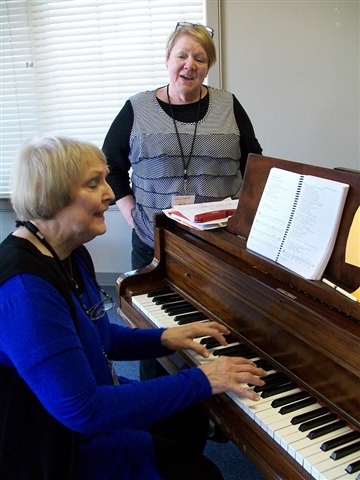 Pam Roy, pastor of First UMC in Welsh, said that, as a first-time 5-Day Academy attendee, the experience reminded her "that we really need to slow down enough to be still and know that God is God." "Whether we use a formal liturgy or if we begin by spending time just in prayer, whether it's morning, noon or night, or seven times, as it is suggested, we need that -- to get our roots stronger, our very core centered and refocused on the love of God, so that we can go about doing our work as being the witnesses we should be." Another first-timer, Rev. Mark Strickland of Oakdale, said the retreat is a great way to "disconnect from daily responsibilities and focus upon one's relationship with God, giving time to the nurture of the soul with some great spiritual teachers in Christian formation." Building a spiritual formation is "really about a walk with the Lord, drawing closer to God," said Sheila Danzell, who attends St. Paul UMC Shreveport as well as McKinney UMC in Texas. "The things that I learn here I actually put in practice, such as praying the Scriptures," she said. Rev. Frances Hooton, pastor of Eros UMC in Antioch, said this is her second time attending the 5-Day Academy. She is director of the Academy for Spiritual Leadership for the Louisiana Annual Conference. "It's just an enriching time of worship and spiritual formation. We've had two excellent retreat leaders, Sister Kathleen Flood and Robert Benson. Sister Flood is teaching us about praying the Psalms and praying Scripture, and Robert Benson is helping us make a commitment to praying the ancient hours of the day," she said. "It's been a wealth of both Scriptural knowledge and history of prayer but it's also been an opportunity to experience those prayer forms and find the things that resonate in our personal spiritual lives, and how to develop a plan to maintain a commitment to it, whether you are a pastor or a lay person," Hooton said.